The aliens and their fetish for pants are a complete winner in My Book Corner. Just the title of this one has my youngest in fits of laughter. 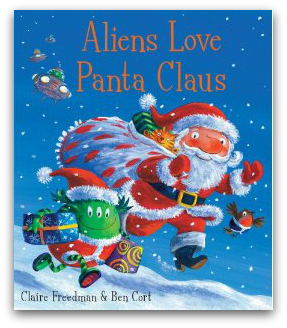 In this spin off, Aliens Love Panta Claus, the aliens help Santa Claus to save Christmas. The joyful rhyming, festive illustrations and humour all combine to produce a beautiful, light hearted Christmas tale.